The world's most amazing globe, the MOVA globe rotates silently with no power cords or batteries, it only uses the light of your home or office. The globes are available in different sizes and numerous styles. 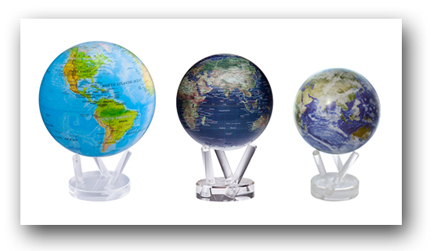 Included with each globe is a three pronged acrylic base for easy displaying of your new treasure. The MOVA globe has an inner globe that rotates and an acrylic outer shell which does not rotate. The space between the inner globe and outer shell is filled with a safe, clear liquid that supports the inner globe and allows the inner globe to rotate. The graphics on the inner globe are magnified by the liquid and gives the illusion that the outer shell is moving. A drive mechanism within the inner globe drives the rotation. Energy for the drive is provided by solar cells within the inner globe. The drive includes a magnetic element, much like a compass, to provide the power to drive the globe. All of this works together to create a beautiful piece of functioning artwork.